There are lots of things you can do to try to increase ad sales. But you should do these six things now for the biggest gains. If you need to drive up advertising revenue in your ad department, here are the big things you should do first if you haven't done them already. They're based on my experience over the years helping over 1,000 newspapers and other local publications increase sales quickly. I've found these things, in particular, make a quick and substantial impact on the success of each sale as well as the size of the contracts your ad reps ultimately sell. They're taken from my award-winning ad sales and management system. There are some businesses that can and need to spend dramatically more money than others on advertising, even when they claim (or really believe) they don’t. For a quick shot of revenue, encourage your ad reps to go after those prospects first. 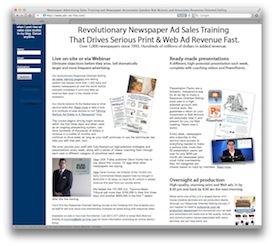 Not long ago, part of my ad sales training services included actual on-site sales calls on behalf of my client newspaper (I've since replaced that part with a huge self-service site full of presentations and 100+ videos on how to sell each one). Since part of my compensation was based on the revenue I'd bring in, I’d send ahead a "hit list" of 50 categories of prospects on which I only wanted to focus. They were the ones I found were the easiest to sell and to sell big. Knowing who they were enabled me to close, in just a few days, $300,000 worth of sales because I knew exactly where the money was before setting foot in the market. They're actually pretty easy to identify and here's how. Look for businesses who have a high average sale. When you think about it, even with a bad response, they’d probably still be making money from your publication, so it's not a huge risk for them if you can make a case they'll get any response. But that’s not the reason they need to spend more money. They need to because, for an expensive item, typically there are much fewer people in the market at any given time compared to people buying less expensive items. For example, think how often you’re in the market for a car, jewelry, or a new driveway. All expensive things you buy infrequently. With a smaller universe of people each week who is about to buy these more expensive kinds of products and services, these businesses need to go all in with a large ad that all those few people see. That's because of the natural drop off that occurs between the amount of people who actually see the ad and those who ultimately buy. They can’t afford anyone in the market about to buy their products missing their smaller ad, or they might run out of people before anyone even comes into the store or buys. So, they both need to run big and they can. The perfect combination. So who fits into this category? Doctors, lawyers, real estate agents, flooring dealers, furniture dealers, roofers, hearing aid specialists, garage door installers, HVAC professionals, pool builders, home security specialists, and pest control companies to name just a few. Try not to get caught in the trap of only looking at who’s running elsewhere, who’s spending the most in other places, or whose business just looks big. Often the most money can come from businesses not running at all or a seemingly small business. When a prospect presents an objection early on in the sales process, it seems only logical that the ad rep should say or show something to overcome the objection. Most likely, your ad reps have answers to the most common objections at the ready. But no matter how solid the ad rep's argument is, a back-and-forth debate at the beginning of the call typically does more harm than good. There's a much more effective way for ad reps to get past these and come out way ahead.